As Stony Brook has furthered its reputation as a STEM (science, technology, engineering and math) school over the years, the university has looked for ways to overcome the gender imbalance in these fields. Women made up almost half of the U.S. workforce in 2015, but they held only 24 percent of STEM jobs, according to a 2017 report from the U.S. Department of Commerce. 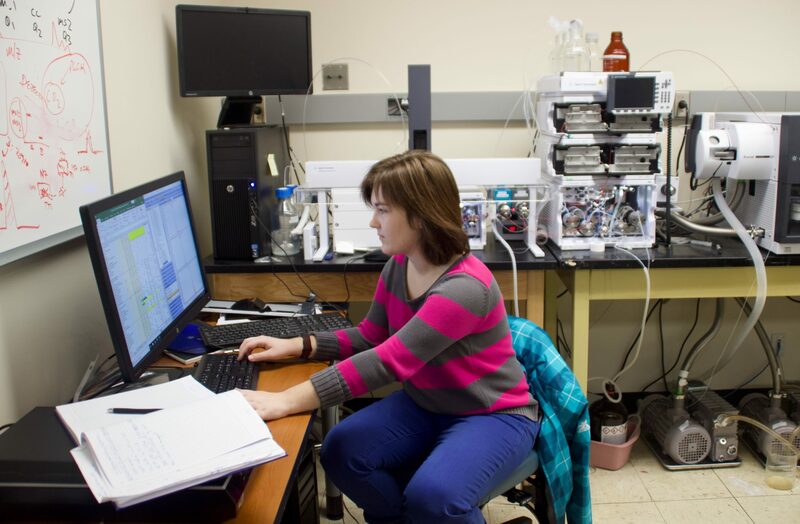 At Stony Brook, two out of four of the most popular undergraduate STEM programs are male dominated, according to Fall 2018 enrollment data from the University’s Office of Institutional Research, Planning & Effectiveness. The computer science program is around 19 percent female and the applied mathematics and statistics program is around 32 percent female. The biology and health sciences programs on the other hand, have more females than males, with female students accounting for around 59 percent and 68 percent of enrollment respectively. Founded in 1993, the Women in Science and Engineering (WISE) honors program has drawn in more female high school graduates who have a demonstrated aptitude and interest in STEM. WISE also has a pre-college program aimed at inspiring young women from local secondary schools to explore the world of STEM. “Combining the vast resources of a major university with the close bonds of a small community, the WISE College Program enables undergraduate women to work closely with peers and faculty to form friendships and to achieve a solid background in their field,” Dr. Mónica F. Bugallo, the faculty director of WISE, said. Students must apply to the program and all those who are accepted receive some scholarship support. In addition to fulfilling their major and degree requirements, students in the program must complete the 20-credit WISE course sequence over the course of four years. The core of the curriculum emphasizes not only academic excellence in STEM, but also service, leadership, research and career development. Sophomore applied mathematics and statistics major and WISE student Ersha Kumar said that when she was younger, she didn’t think a career in STEM was a viable option for her. “We don’t really see many women working in those fields as we grow up,” she said. The university was not able to provide enrollment data going back to the year WISE was founded. But more recent numbers show that Stony Brook is slowly bringing more women into the STEM fields. Elizabeth Nyamayaro is the senior advisor to the under-secretary general and executive director of UN Women and global head of the HeForShe initiative, a campaign that encourages men and boys to promote gender equality. In an interview with Forbes, she noted that women’s enrollment across all STEM programs at SBU has increased by 46.6 percent since 2013. “One of our HeForShe Champions, Stony Brook University, is working to correct the gender imbalance in STEM majors to help their students and faculty understand their own biases and the impact this has on their career paths,” Nyamayaro told Forbes. Some programs have had more difficulty attracting women than others. Since Fall 2008, female undergraduate enrollment has gone up by seven percentage points in biology and 10 percentage points in computer science. Meanwhile, female undergraduate enrollment in the applied mathematics and statistics programs went down by eight percentage points since then. Engineering has become one of the most popular fields of study at Stony Brook. Since 2008 the number of undergraduate students enrolled in the College of Engineering and Applied Sciences (CEAS) has gone up by almost 114 percent while combined enrollment in all other colleges has decreased by 4 percent. Overall, undergraduate women make up only 24 percent of the CEAS’s total population. But, this represents an increase of 6 percent since 2008. “Although it’s a good sign that more female freshman are coming in, we have to really retain them, so that they feel that a STEM career is something they want and can pursue,” Min Um-Mandhyan, director of development for CEAS, said. Aveni said that she believes the WISE program offers women the right kinds of support to be successful and confident in themselves and their goals in STEM. A Qualtrics survey answered by 34 students in her WISE 105 class found that 80 percent of students were optimistic, motivated and excited about their choice to major and eventually work in STEM fields. Marisa Petrusky, a sophomore physics major in the program, echoed this sentiment.